Mother Nature has thrown another wrench into plans for re-establishing the wolf population on Isle Royale. One of four captured wolves the National Park Service brought to the Lake Superior island last fall has taken advantage of an ice bridge to return to the mainland. That reduces the original quartet to two. The only male in the group, was discovered dead in November. "Nature and the instincts of wildlife will always prevail in the wilderness of Isle Royale," park superintendent Phyllis Green said in a statement. The wolf population on Isle Royale was nearly extinct following years of inbreeding and disease. Warmer winters made things worse, as ice bridges between the island and mainland weren't forming as often. Meanwhile, the moose population was surging. About 1,500 moose — and their big appetites — posed a threat to Isle Royale's vegetation. So, wildlife officials hatched a plan last year for restoring the predator-prey balance: They'd step in where nature wouldn't and bring over 20 to 30 mainland wolves to the island, since the ice bridge dearth made it impossible for the wolves to get there themselves. An ice bridge formed between Isle Royale and the mainland, and one female wolf took advantage of it on Jan 31. 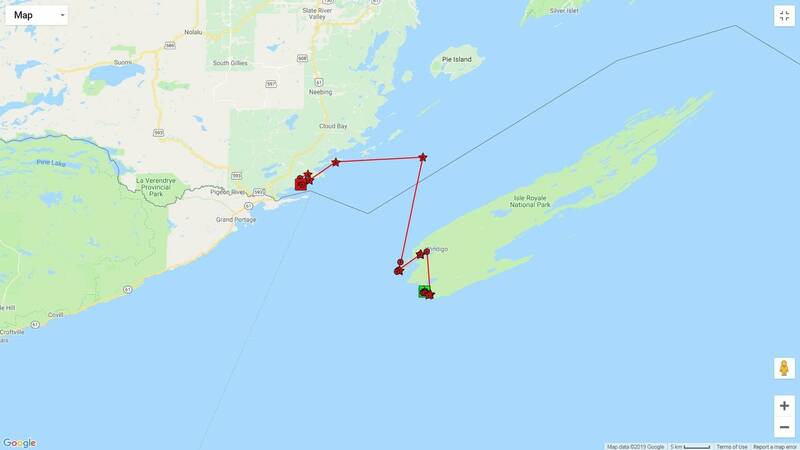 The wolf — fitted with a tracking collar and labeled F003 — took a crooked path on the ice to cross the 15 miles between the island and the mainland. She wound up just north of the Pigeon River near the Minnesota-Canada border, according to the National Park Service. "When we made the decision to restore the predator-prey relationship, we knew we would have to respectfully work with whatever curves nature threw at us, whether it's adverse weather or wolves working out where they choose to fit on the landscape," Green said. Early research on relocating wolves found that the animals would try to return if they're moved fewer than 80 miles, Dave Mech, a federal wolf biologist, said in a statement. So, he said, it's not surprising that F003 tried to get back to the mainland. "However, we also found that if they were held in the release area for three to four weeks they generally stayed in the area," Mech said. "Since all of the new wolves were moved in the fall it will take time to tease out the behaviors related to translocation." The Park Service still plans to relocate wolves over the next three to five years and monitor them for the next two decades. In all, the project is expected to cost $2 million. The project hasn't yet received final funding approval for 2019, according to the Park Service.